Q4tQ: Was what happened in her questline what she had always planned on doing since the beginning, escaping the blade and (possibly) N’Zoth? There’s not actually a lot of information out there about our dear friend Xal’atath, unfortunately. I mean, we have the history of the blade, but not the entity apparently dwelling within it. However, Xal’atath spent a lot of time chatting to Priests in Legion, and in all its chatter it made it very clear that it’s not only been around a long, long time, but it’s also very familiar with Azeroth’s history. Given what we know about the Void — that it sees all possibilities as potential truths — one could assume that Xal’atath knows exactly what it’s doing, where it’s going, and what steps it has to take to get to the point of eventual freedom. Whatever that immortal entity is — or was, during the age of the Black Empire — it was obviously a servant of the Old Gods in one form or another. I don’t think it was necessarily bound to one Old God over another, however. Part of its chatter during Legion indicated a particular disdain for N’Zoth, going so far as to call N’Zoth the weakest of the Old Gods. Whatever was done to Xal’atath, whatever bound that entity to the blade, it wasn’t particularly happy about it. So yes, it’s entirely possible Xal’atath’s existence and movements throughout history were all for the express purpose of one day being free. This isn’t a definite yes, though — we don’t have enough information for that. It’s just a possibility. We’re really not doing so great on the answering questions that aren’t thoroughly baffling mysteries, are we. I doubt I’ll ever consider BfA ‘best ever’ expansion material, but I wonder if any other expansion has had such a potential turn around in quality like BfA might? Honestly, I think Mists of Pandaria fits that bill. There were a lot of people that weren’t exactly thrilled about the idea of Pandaren or Pandaria, and a lot of people were annoyed at the idea that an April Fool’s joke was getting its own expansion. When the expansion came out, the litany of daily quests and rep grinding at max level didn’t make people very happy either. But as the expansion progressed, it kept improving — and the story was thoroughly engaging as well. Yes, by the end of the expansion people were really, really sick of it, but I don’t think that was the expansion’s fault so much as the massive delay between the release of Siege of Orgrimmar, and the release of Warlords. If there had only been six months between the last raid release and the launch of the next expansion, I think more people would’ve ranked Mists higher in the list of expansions they loved. Feels like that’s something Blizzard forgot about when designing Draenor. What an excellent question! One would think with the presence of Rexxar, the other Mok’nathal would be hiding around there somewhere, right? This isn’t exactly a baffling mystery so much as potentially unreleased content. At one point Farahlon was supposed to be part of the Warlords expansion — it was even on the maps shown at BlizzCon 2013. Supposedly, it was going to be added in a later patch, like the Isle of Thunder, the Timeless Isle, or the Isle of Giants. It never made it that far, though. 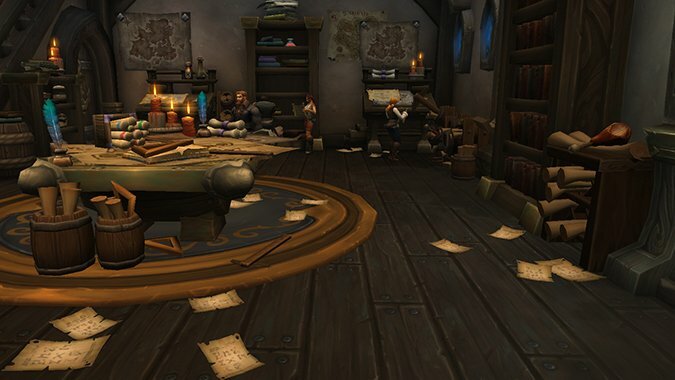 Originally it was going to be a place where boosted players could start in and get gear, much like how the Timeless Isle gave boosted players gear that was good enough to get around on Pandaria. But when they started developing Tanaan, they realized Tanaan was already a place where that could exist. So Farahlon was scrapped, and anything that might have been on that mysterious island fell by the wayside, left only as the subject of a naval mission. As someone who really likes the Mok’nathal and was looking forward to seeing more of their history, as well as a fan of Netherstorm wondering what that place was like before Outland went all…outlanded, I’m still really disappointed about that. Q4tQ: Is the in built voice chat any good? I remember the first time Blizzard attempted this, and it was quite bad. Is the new one an improvement? It’s not bad! Having said that, I still prefer using Discord to talk to people while I’m playing. If you’re comparing it to the version introduced back in Burning Crusade, however, it’s light years ahead of that old system. If you’ve ever talked to anyone while playing Overwatch, it’s on that level. Sound quality is decent, it’s easy enough to use, and it works without any issues. You may not find a ton of people using it, though — most people seem to still lean towards using third party voice chat programs. Q4tq: I have been looking into Druid lore and came across xarantaur and was wondering if you could elaborate on who he is and why we haven’t heard much more about him since wrath? Xarantaur’s history is pretty much spelled out if you go talk to him in-game — but that’s the in-game character. The NPC is actually based on a player that went by that moniker who did a series of Lore Q&A threads on the WoW EU forums. He was implemented in-game and given a quest for players at the request of Chris Metzen. As with most player-reference characters, he was simply added in for one expansion as a nod to the player, and that was the extent of his inclusion. Since he appears in game, he is considered a canon character, but it’s doubtful we’ll ever see him referenced again. Nope, they’re busted! I know this wasn’t a question exactly, but I figure hey, if we stick it up front and center in the Queue here, maybe a rogue developer will see it and nudge someone to get the problem fixed so the things work again. It’s Monday. I need my parties.